At M Wright Electrical we are fully qualified electrical engineers and electrical contractors. We offer a range of commercial electrical services to our customers including electrical installations and periodic inspections. We are based in Scunthorpe and cover all of North Lincolnshire including Brigg, Gainsborough and surrounding areas. We have carried out work in all types of commercial premises including offices, shops, factories, warehouses, hotels and agricultural buildings. Contact us to to discuss how we can help with your project. We’ve got over 40 years of trade experience. 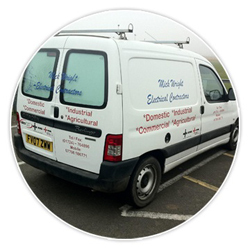 We have lots of experience covering all types of electrical testing, inspection, pat testing and installation. Our commercial work has seen us work on projects in small shops through to large factories and supermarkets. All our work is carried out in accordance with the 17th edition of the IEE Regs. We are NICEIC registered and Part P Approved. We offer free estimates and a 24 hour service, so you can rely on us to provide a safe, competent and comprehensive electrical service. Contact us today for further information. We are based near Scunthorpe which gives us easy access to the whole of Lincolnshire, Yorkshire and beyond. We have carried out commercial projects across the country, but the majority of our work is in Scunthorpe, Brigg and Gainsborough.